This was the first all-out HQ I did for this army. He looks like a spider, and I'd planned a Doctor Octopus style second version as a Dreadnought stand-in, but never got around to it. I consider it my most psychic piece: it was made before the Techmarine-as-commander rules were released for 4th edition. 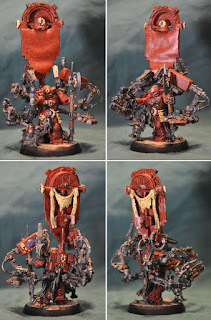 The figure itself is a regular box set techmarine with additional servo-arms taken from the box set on almost all the joints. Extra shorter arms were added at the two top primary joins, while a control screen was converted and added to the left plasma cutter arm. The battle standard replaced the transmitter portion of the backpack. 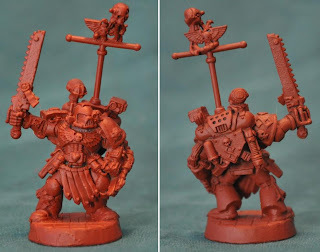 Basically a pewter standard pole surmounted with a tomb kings standard and techy bitz, the front was meant to be painted and ragged-looking, representing the standard salvaged from the ruins of the 7 layered Forge World of Vulcan. Finally, the mascot of my army rides for the very first time in this piece: this Epic Killa Kan is eager for some action. Born from the chassis of another awesome tech marine, this is my favorite conversion in the army. While the concept is functionally similar to the Fabricator General, the execution is much cleaner. If I had to choose one piece in the army to display always, it would be this one. I use two servo-arms from the original kit. I replace one with a servo-skull controller and associated guitar-wire control cable. The other becomes a more refined version of the viewscreen included on the Fabricator General. Even the Killa Kan has an auspex. The banner is a custom book, and is topped with dials from the old Dwarven flame gun. On his back, a set of scrolls carried to record the exploits of his chapter. The entire piece is given motion through carefully placed and bent purity seals. The Genetor is my version of the Chaplain. They preach healing and recovery instead of genetic purity and oversee the conversion of new Space Marines. Thanks to their advances, only one in ten neophytes fail to become marines. This was my first attempt with guitar wire and the servo skulls give it some presence no matter which way you're looking at the figure. The gaudy Mercurial staff hints at the healing in his injections. Chaos beware, one drop of these unguents and you'll be brought back to mortality before he kills you, a fate worse than mere death. The green plants springing from his footsteps indicate the healing he brings to the dead world of Vulcan, ravaged by Tyranids. Sometimes the Genetor has to get out. When he does, it's on rockets, with dual lightning claws and his best departed servo-skull friend to acompany him. The fig is a torso and axe arm from the blood angels tech marine. To all you classic minis fans out there: sorry, yes, I mutilated it. No, I have no remorse. Simple conversion of an awesome mini with a base that makes it pop. The only embellishments on the figure itself are the Mercurial interleave I've added on the right shoulder and left knee. The base is meant to be finished with water effects as if he's standing on the shoreline of a renewed sea teaming with restored life. And finally, the humble apothecary becomes a dynamic company commander with the addition or This is SPARTA! 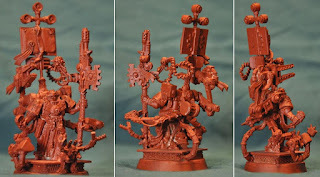 leather crotch danglies and more apothecary tools courtesy the command squad kit and a DA servo-skull like every good commander needs. His backpack is also the new kit. I think he's a pleasant blend of old and new, don't you?